In 2013, Blue Diamond opened a new Almond Innovation Center, which is home to our research and development teams and is unlike any other product development facility in the almond industry. With expansive labs, proprietary development equipment, and trusted staff, it is Blue Diamond’s powerhouse of innovation. We continue to expand our application development work in confectionery, cereals, bakery, dairy, and other product categories. We collaborate closely with our customers’ research and development teams, while continuing to develop creative new ways to use almonds as ingredients. Our Almond Innovation Center is the birthplace of inspiration. It’s where we incubate new and exciting almond ingredients, as well as product applications. Think of Blue Diamond as an extension of your own research and development team. Any way you slice, dice, or chop it, we have a form that’s right for your product. 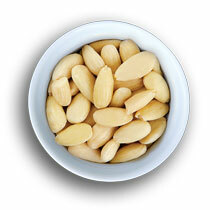 We produce millions of pounds of almonds annually. With so many distinct varieties and in so many different forms – the possibilities for your applications are endless! Delicious options. Plain and simple. When your customers are enjoying almonds in their cereal, baked goods or chocolate, they’re not thinking about what kind of almonds they’re eating. Fortunately, we are. 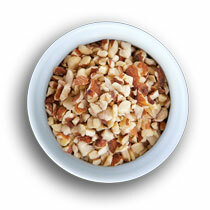 Take a look at the breadth of almond varieties from Blue Diamond. 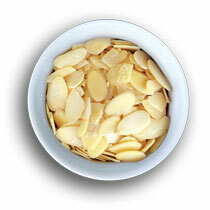 Slivered or sliced—our almonds are always in good form. But knowing which ones will be best for your formulations is a tough nut to crack. Do you go with a small or medium dice? Whole or split? And how will those decisions affect your sales? We can help you identify solutions that keep your bottom line and your consumers happy. Today, consumers are actively involved in managing their diets—increasingly looking for nutrient dense foods to help support an overall healthy lifestyle. With Blue Diamond Almond Flour, you can easily transition from traditional flour in your recipes without compromising taste or texture. 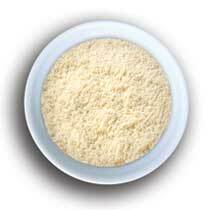 Blue Diamond Almond Flour offers a smooth mouthfeel and adds a rich, buttery flavor. Finally, consumers do not have to sacrifice taste to create healthier, more nutritious versions of the recipes they already love. Quality counts…the United States Department of Agriculture maintains strict standards and grades for California Almonds—and we couldn’t agree more. 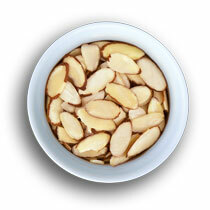 At Blue Diamond we believe you must have quality almonds for your formulations. Not only to meet the USDA standards, but to exceed yours. * U.S. No. 1 is commonly referred to as Supreme by the industry. However, Supreme is not a USDA grade. U.S. Fancy The highest grade—typically appropriate for products where the visual appeal of the almond is critical to the application. This grade is not widely used. U.S. Extra No. 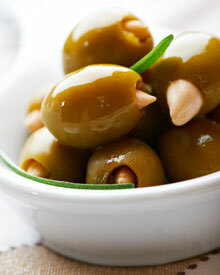 1 Similar to U.S. Fancy—ideal for food applications where the appearance of the almond is very important. U.S. No. 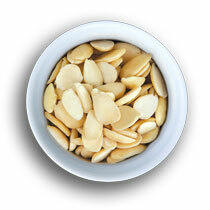 1 (Supreme) Typically used to whole almond applications or for further processing such as blanching and roasting. U.S. Select Sheller Run Mid-quality grade—good choice for applications where the almonds with minimal sorting/processing can be incorporated with other ingredients; for example, inside a confectionery product and where a higher level of chipped and scratched kernels is accepted. 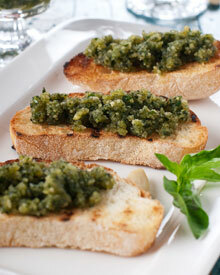 Also appropriate for further processing such as blanching, grinding, roasting, dicing, and slicing. U.S. Standard Sheller Run Good grade for further processing such as blanching, dicing, grinding, or paste, particularly where a higher level of split and broken kernels is not a concern. Reap from what Blue Diamond sows. California produces over 80% of the world’s almonds. And over half of California’s almond growers are members of our cooperative—maintaining the highest standards of responsible farming practices since 1910. See what happens season–to–season until the moment when mature almonds become Blue Diamond almonds. From cereals to baked goods and more, when you add Blue Diamond almonds you deliver texture, flavor, quality, crunch, and nutritional value. No matter what kind of product you’re developing, we know how to give your formulations a delicious focal point or an indispensable side note. Just add almonds! Blue Diamond can partner with you to formulate your confectionary products for maximum success in the marketplace. We start by asking the right questions about size, forms, and flavor pairing. Then, we leverage our extensive R&D expertise to help you create the optimal combination. 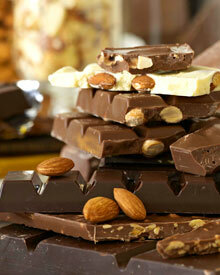 70% of consumers are more inclined to buy chocolate bars with almonds than without. Consumers rated almonds as the nut that best fits in both milk and dark chocolate. 75% of consumers worldwide believe chocolate with almonds is nutritious. Consumers believe almonds are the nut that best delivers nutrition in chocolate products. Almonds outperform all other nuts on the top four attributes consumers seek in a chocolate bar. 70% of consumers worldwide state they are more likely to buy chocolate with almonds versus chocolate without. When asked what they would like to eat with their chocolate, 41% of consumers said almonds. Consumers have already made almonds the #1 preferred nut in cereals. But don’t stop there. Are you getting the maximum contribution from your almond ingredient? Do the almond form and variety ensure the perfect mouth-feel? Are they complementing the desired application? We have the expertise to help you answer those questions. 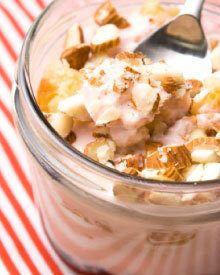 Almonds are North Americans’ most preferred and most consumed nut at breakfast. In a recent survey, almonds were the #1 ingredient that North American health- and food-involved consumers envisioned in their “ideal” cereal. 1Breakfast Outlook Report, Sterling-Rice Group, 2009. Welcome to one of the fastest-rising food trends worldwide: The U.S. snack and cereal bar industry accounts for approximately half of the food bars sold worldwide. The category, in the U.S., is forecasted to surpass $8 billion in revenue by 2017.1 Consumers are eating more frequent meals throughout the day, choosing guilt-free snacking and eating on-the-go for both health and convenience. Almonds are always “value-added” when it comes to consumer favorites in baked goods. Their flavor, crunch and nutrition have made them the #1 nut globally for new bakery products. And artisanal baked goods that include almonds account for 50% of bakery sales in the U.S., whether it’s sliced almonds on Danish or almond paste in croissants. Furthermore, almonds are playing a leading role in the increasing trend toward healthy nutrition and also gluten-free diets. The $10.5 billion gluten-free retail food and beverage category grew 44% from 2011 to 2013 as awareness of these conditions increased. And three-quarters of gluten-free consumers don’t even have a sensitivity, but still believe that eating gluten-free is a healthier lifestyle. 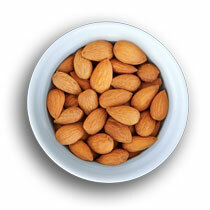 Almonds in all forms are high in protein, fiber, antioxidants, and healthy fats. 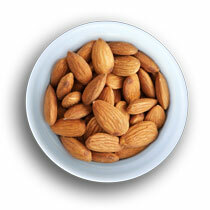 The same great product benefit of Blue Diamond almonds are offered with Blue Diamond Almond Flour. Blue Diamond Almond Flour is available in three forms to suit most baking and cooking needs: Extra Fine Blanched Almond Flour, Extra Fine Natural Almond Flour, and Fine Blanched Almond Flour. Almond flour produces moist baked goods. While traditional baked goods may become dry and stale in a day or two, those prepared with almond flour stay moist for days. Because almond flour does not contain gluten, there is no need to worry about over mixing batters, which can make cakes, pie crusts, and quick breads dense and chewy in texture. Blue Diamond Extra Fine Blanched Almond Flour is the finest granulation almond flour available on the market today. 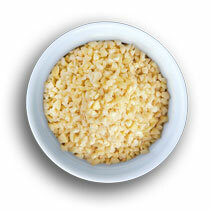 Its powder-like consistency delivers a smooth texture and mouth feel. Extra Fine Blanched Almond Flour is a perfect ingredient for even the most delicate and lightest of pastries. Blue Diamond offers an Extra Fine Natural Almond Flour that has a comparable granulation to blanched almond flour at a more econonmical price point. With its natural light tan color, our natural flour gives your baked goods a rustic, artisanal appearance. Blue Diamond Fine Blanched Almond Flour gives nutrition and texture to every-day baking and cooking. 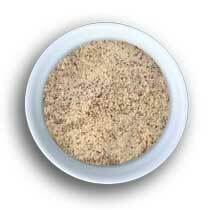 It is also a breadcrumb alternative for coating fried poultry, fish, and vegetables, adding flavor and nutrition to any dish without becoming greasy or soggy. 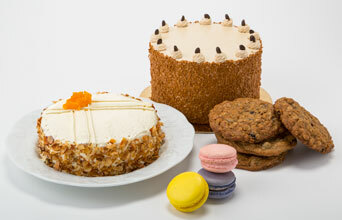 Almonds are the only nut that drives strong usage across desserts, salads, sandwiches, entrees, and bakery. Artisanal products account for 50% of retail bakery sales volume in the U.S.
Consumers are willing to pay more for traditional and specialty products with almonds. Greek yogurt is another food trend that’s on the rise in popularity. 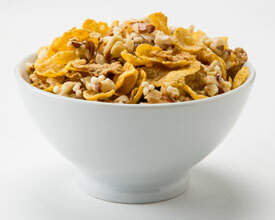 “Mix-ins” such as almonds, granola, or fruit add value with increased flavor and texture. Consumers love the contrast of creamy yogurt with crispy, crunchy textures, and mouth-feel plays a major role in shoppers’ purchasing decisions. Almonds are the perfect partner in this market, with a versatility in form from sliced, diced, split, chopped and natural flakes. 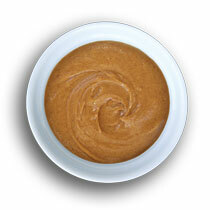 They can provide a satisfying crunch within the product, or as a topping, coating, or crust. 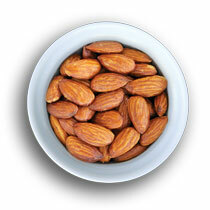 Over the last decade, almonds have entered and dominated the growing snack industry. Once word got out about the major health benefits – combined with their irresistible crunch and flavor – almonds began appearing across the entire snack category. They are always the nut mentioned first by consumers in relation to snacks. And they’re so versatile – from plain almonds for snacking to flavored almonds in salad toppings, trail mixes, and more, this nut does it all. 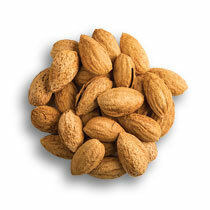 In North America, almonds are the leading nut introduced in new snacks. In North America, almond product dollar sales for granola bars make up 33% share of the total category. Almonds are the top nut described by global consumers as satisfying. Beginning in 2011, almonds were the top nut for first mentions in top-of-mind awareness, and in Europe almonds moved up from third position to second. Almonds are first in consumer preference for coatings on ice cream bars. No matter what your product or application, chances are good that it will be enhanced by the addition of almonds in one of their many forms. From breakfast to a late-night snack, almonds are the value-adding ingredient that can “plus” your product. 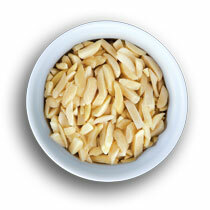 Upgrading plain rice to pilaf with slivered almonds. Adding a crunch to Asian salads. Giving texture to ice cream or yogurt. Transforming string beans into beans almandine. Increasing the nutritional value of your health bars. Converting your product to gluten-free. Enhancing your chocolate bar with taste and texture.